First, I completely forgot to give you all the decision on the HomeGoods table I loved. days and cold nights last week stalled any progress. Remember last year when I found this settee at a yard sale and re-did the cushions? below. I was pleasantly surprised to find my pattern labeled and ready to go, woo hoo! day, they were in the fridge, and sadly still are! Lowes for $10.99 I think it will give me the exact look I'm going for. I noticed this sign next to a potted pine tree for sale in the garden section at Lowes. Right above it was a nest with about four babies. evergreens I've been watching, but haven't seen them yet. Last year it was on May 9th, so we could be out of luck. One more thing, a tip for bloggers! Oh my goodness, seriously, and my name all over it! Since then I put text on my photos that states 'In Progress,' to alleviate any confusion!! Whew, that was wordy ~ I'll go now! The Pier1 story made me laugh! I will out "in Progress" on mine now too. Can't wait to see your cushions. I'm working on our porch too! We used the same color cushions and now it's just the fun pillows to go! Can't wait to see yours! Love the neutrals and the pillows do take up the slack for patterns! Loved the baby birds! Haha- the Pier One Pinterest board, you heart must have jumped when you saw it represented as your work! I love both inspirations, will be so fun to see what you come up with. I have seen drop cloths used for curtains before, I think Brooke Giannetti did that in her last house. I like the design of the settee. Are yu painting it black? Sweet little nest...springtime is when the miracle of Mother Nature really reveals itself in so many ways! Oh yes....that is going to look fantastic...and so you!!! the outdoor fabric I put on my curbside find chairs faded incredibly. I figure one more season for them then I am going to go neutral as well. It's just fun to be able to change things yo isn't it? Super cool that Pier 1 picked up one of your pins, even if it was a progress pic.! Looking forward to seeing your redo. I love the neutral cushions and that stone console! Can't wait to see what you create. It's going to be amazing. I love the neutral cushions - we too chose the off white cushions for ours. Can't wait to see it all done~~!! love your plans! Simple and clean! The inspiration photo is dynamite! The weather in Georgia has been chilly, if not cold! Just this weekend things began to change! I'm giving up on flowers! I usually get huge pots and watch them die! I had fabulous luck last year with fern at front door, very inexpensive at Lowes ($7.00) for a large pot. Think I'll use them in the back. Will soften the hard surfaces and be lushy green! Pam, whatever you come up with, I am super sure it will look fabulous. I still have to bring out all my outdoor stuff as well. :-) Hope you had a wonderful Mothers day! I love your inspiration photos..I already know that its going to look great...you have that magic touch! Can't wait to see how it comes out. Love the image of the baby birds. So so so sweet. That is too funny about the Pier 1 board! 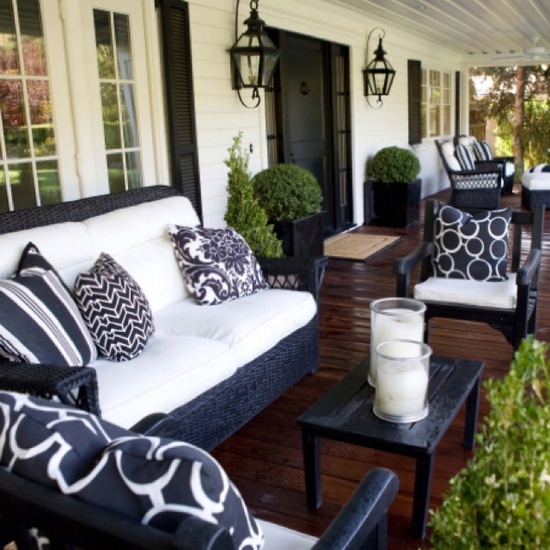 I would love to have an outdoor covered porch and a big lounge area. My deck area is narrow and not big enough for more than a few chairs. Have fun and good note to self about the Progress shot photos! So funny about your cushions, but pretty cool that it was on the Pier 1 board! I love your inspiration photos today, in particular that first one. I have long wanted a gravel patio for our firepit and that photo is getting me fired up all over again (bad pun). Can't wait to see your new, neutral cushions! Can you please tell me where the first inspiration photo is from? 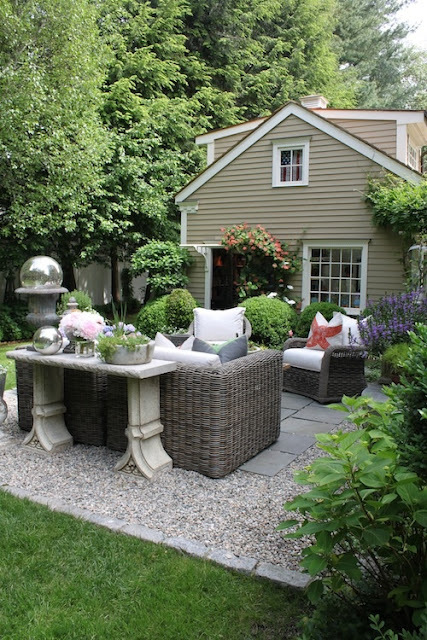 I love the gravel patio and am looking for additional photos of it. I have scoured the web and can't find it anywhere! Thank you! Hi Jami - I'm so sorry, the best I could do was trace it back to this pin which was pinned from Facebook.